On 22 March, Rada arrested a notable ISIS fighter from Sirte, Ahmed Masoud Ammari, On 22 March, a former local security force member thought killed by ISIS was found dead near al-Bartamah. On 21 March, the SPF disposed of three unexploded ordinances suspected of being from when ISIS had control of the city in 2016. On 20 March, Libyan National Army (LNA) forces killed a suspected terrorist from Sirte in Qatrun. The individual’s affiliation has been released. On 22 March, the US State Department warned of an imminent attack on a vital national institution in Tripoli on 23 March. On 25 March, the US Federal Aviation Authority (FAA) reviewed its flight ban over Libyan airspace and is set to allow US carriers to fly over the country above 30,000 feet. On 20 March, UN Envoy to Libya Ghassan Salame announced the details of the long-delayed National Conference. On 20 March, the Government of National Accord (GNA) officially endorsed the new 2019 budget. To monitor the expanding threat posed by the Islamic State's Libyan branch and other jihadi groups in Libya, Jason Pack founded EyeOnISISInLibya.com as a monitoring service detailing the group's history, its interactions with other jihadi actors, and Western actions towards the group. 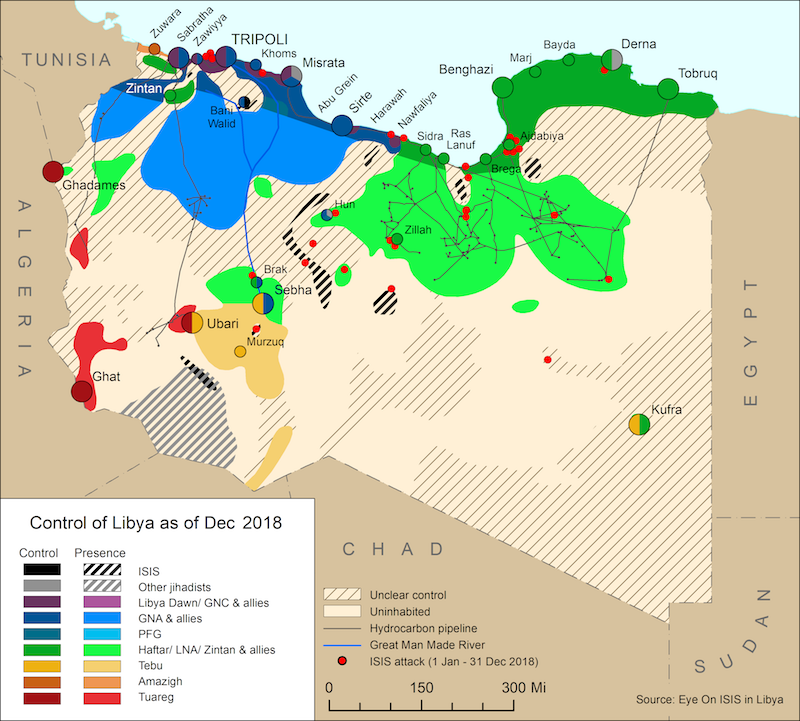 Our aim is to provide a valuable resource for governments, think-tanks, and businesses concerned with jihadi threats and their evolution in Libya. EOIL is very pleased to be partnering with CRCM North Africa, who is a funding sponsor and with whom we have launched the identical mirror site, Libyan Jihad Monitor. EOIL is a New Jersey registered, 501c3 status non profit organization. 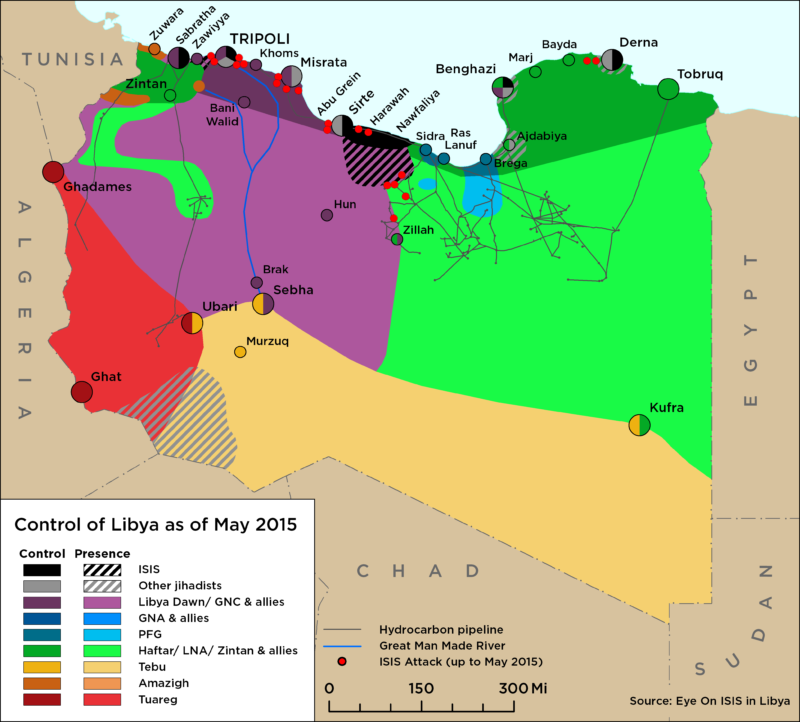 EOIL's seminal paper entitled “The Origins and Evolution of ISIS in Libya,” by Jason Pack, Rhiannon Smith, and Karim Mezran, was published on 20 June 2017. Each week, we provide updates in four sections: ISIS in Action, Western Response, Other Jihadi Groups, and The Anti-ISIS Coalition. All information comes from local sources on the ground and is vetted by a network of academics, consultants and Western security experts. To receive this information as a weekly email, please subscribe.